Long time no posting! Our poor blog has been neglected! We have been on holiday; no not away but enjoying the beautiful place in which we live. 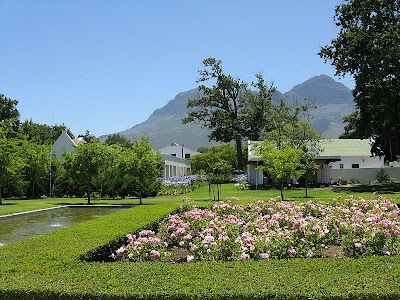 On my Birthday we went on a family outing to Lourensford in Somerset West. Truly beautiful. We started off visiting the Tretchikoff exhibition in the Bell Roberts art gallery. I found it very interesting, as I have never seen so many of his works in one place before. I still can’t understand why he was so ostracised by the art establishment. He certainly sold well. We then moved on to sample and buy some freshly roasted coffee beans from Switch. Oh the aroma!!! Very interesting chap but the shop was so busy that he could not chat much. Bought lots of coffee though. Next on the agenda was Healey's cheese shop – oh my word what divine cheeses. They are far superior to the yellow “plastic” cheese available in most of the supermarkets. It was an exceptionally hot day and not having a cool bag with us we were reluctant to buy much because we planned to go elsewhere for lunch and it would sit in a hot car in the sun. Their cheese is apparently available from Fruit and Veg City in Cape Town. Then we wandered through the gardens, past the fishponds and fountains to the wine tasting room; a beautifully decorated area, all in wood and brick, warm and cosy. From the tasting room you have a view through a huge window of a very modern and almost clinical winery. We were lucky to be served by a really interesting and knowledgeable student who was very informative on the unique processes used at Lourensford. They try to treat the grapes very gently during crushing and filtering. Hoists and gravity are used instead of pumping the juice and skins from tank to tank. The result is wines that are very complex in flavour and reasonably priced too. When we go back we will definitely be having their cheese platter and some wine! On this occasion we did not book at their restaurant as the menu published on their web site looked very limited and we had booked at the Lilly Pad restaurant at Anura. 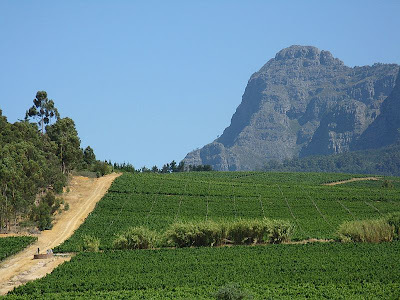 Anura is close to Paarl and not yet a well known Winery. 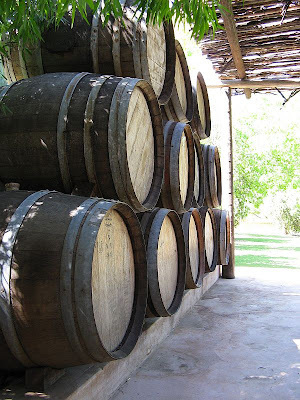 After Lourensford, we found their wines a little flavourless but their restaurant is superb! Well worth a return visit sometime. Unfortunately the temperature was 35 degrees that day leaving us somewhat hot and bothered so not many photos were taken.